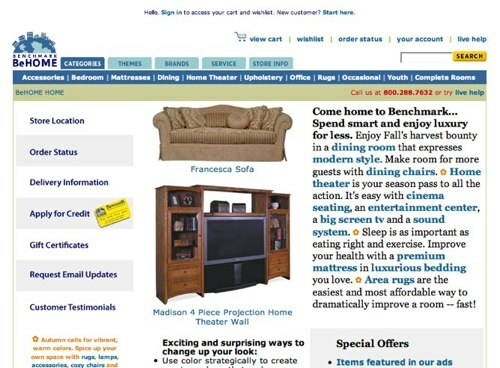 Emily Davidow launched BeHOME (behome.com) in January, 1995 as a combination magalog (magazine + catalog) for home furnishings on the Internet. A pioneering commerce website, BeHOME made shopping for home furnishings easy, fast and fun, combining the best elements of a shelter magazine and a retail store with the unique properties of the Internet. BeHOME sold and shipped furniture throughout the United States, creating a full color catalog, developing private label collections made all over the world and innovating with 3-dimensional views of customizable furniture. Voted #1 site by Furniture Today and featured in New York Times, InStyle Magazine, Virtual City Magazine, HGTV, Home Theater Magazine, HFN (Home Furnishings Network), Furniture Today, High Points Magazine, Greensboro News and Record, HOME magazine and more. High Points Magazine included Emily in their list of the “Top 25 Who Made It Happen”. BeHOME closed for business in 2006 with parent company, Benchmark Industries.